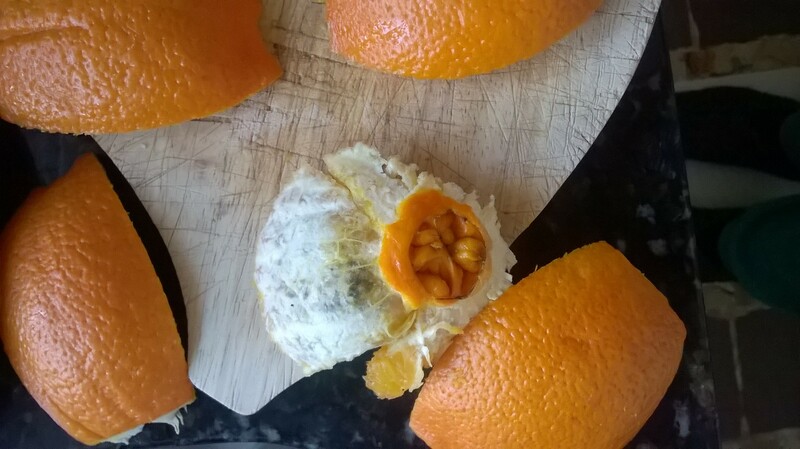 Sometimes I'll cut into a navel orange and notice something black inside which originates at the bottom of the orange, where the navel is. What is it? I have seen it get pretty far into the fruit too. Like almost half way in... is it safe to eat an orange like this? I'm not as familiar with citrus, but tomatoes and peppers can develop something called blossom-end rot. This is caused by the plant not receiving enough nutrients (specifically calcium), whether b/c the plant isn't getting enough water and thus can't get the nutrients out of the soil or b/c the soil is deficient. Regarding whether it's safe to eat, a tomato w/ blossom end rot is still safe to eat, once you remove the affected area. Do you have a picture of the orange in question? That would help greatly with diagnosis. It's probably Alternaria alternata or Black Rot, a type of mold. The fungus penetrates the orange through cracks that develop after harvest or during growth if the tree suffered through drought, frost, or disease. 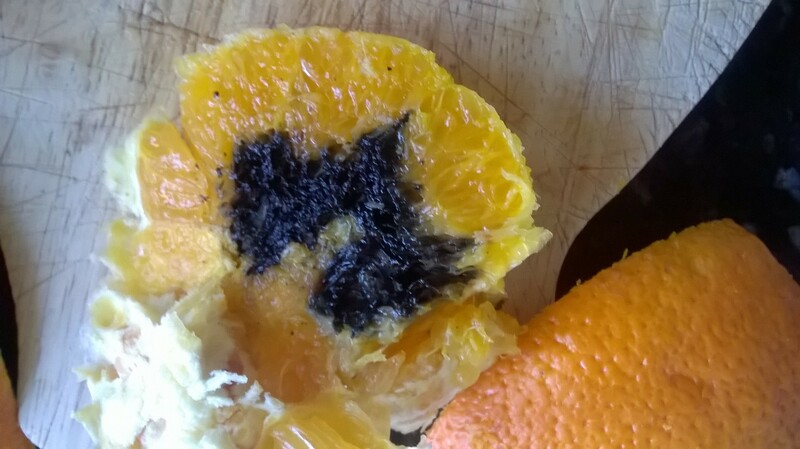 Typically the orange will also have a pale color and after some time will develop black spots on the surface. Discard. I was surprised to have selected one that looked like this on the inside. You really couldn't tell before cutting into it. The rest of the orange looked fine. My family ate it this morning and none of us suffered any ill effects, as of 16 hours later. Depending on how long you have had these oranges, this could be mold. However if you just bought them and the fruit is firm, it is very unlikely. In terms of safety, if it isn't very soft but firm, I don't see a problem with it. Not the answer you're looking for? Browse other questions tagged food-safety citrus oranges or ask your own question. Is a black coating dangerous when cooking on cast iron? What to do with grapefruit seeds? What was a black substance on the surface of cooked brown rice?